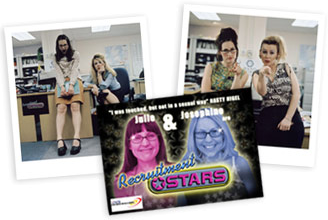 “Recruitment Stars is bursting with ideas, energy and a healthy dose of sass.” The List. Who wins? You decide! Forget I’m A Celebrity… or Big Brother this is TV’s latest reality-television-docu-soap-competition set within the cutthroat, non-stop, action-packed world of recruitment. Take your seat for the nail-biting live final and find out what happens when X Factor meets the Job Centre.